Last week, the Washington Post ran an article by Jim Tankersley on what would happen if Trump got his way and the US imposed steep tariffs on goods from Mexico and China. I ended up as the objectively pro-Trump voice in the piece. The core of it was an estimates from Mark Zandi at Moody’s that a 45% tariff on goods from China and a 35% tariff on goods from Mexico (I don’t know where these exact numbers came from) would have an effect on the US comparable to the Great Recession, with output and employment both falling by about 5 percent relative to the baseline. About half this 5 percent fall in GDP would be due to retaliatory tariffs from China and Mexcio, and about half would come from the US tariffs themselves. As I told the Post, I think this is nuts. Let me explain why I think that, and what a more realistic estimate would look like. But first, I should say that Tankersley did exactly what one ought to do with this story — asked the right question and went to a respected expert to help him answer it. The problem is with what that expert said, not the reporting. I should also say that my criticisms were presented clearly and accurately in the piece. But of course, there’s only so much you can say in even a generous quote in a newspaper article. Hence this post. I haven’t seen the Moody’s analysis (it’s proprietary). All I know is what’s in the article, and the general explanation that Tankersley gave me in the interview. But from what I can tell, Zandi and his team want to tell a story like this. When the US imposes a tariff, it boosts the price of imported goods but leads to no substitution away from them. Instead, higher import prices just mean lower real incomes in the US. Then, when China and Mexico retaliate, that does lead to substitution away from US goods, and the lost exports reduce US real incomes further. But only under the most extreme assumptions can you get Zandi’s numbers out of this story. While this kind of forecasting might seem mysterious, it mostly comes down to picking values for a few parameters — that is, making numerical guesses about relationships between the variables of interest. In this case, we have to answer three questions. The first question is, how much of the tariff is paid by the purchasers of imported goods, as opposed to the producers? The second question is, how do purchasers respond to higher prices — by substituting to domestic goods, by substituting to imports from other countries, or by simply paying the higher prices? Substitution to domestic goods is expansionary (boosts demand here), substitution to imports from elsewhere is neutral, and paying the higher prices is contractionary, since it reduces the income available for domestic spending. And the third question is, how much does a given shift in demand ultimately move GDP? The answer to the first question gives us the passthrough parameter. The answer to the second question gives us two price elasticities — a bilateral elasticity for imports from that one country, and an overall elasticity for total imports. The answer to the third question gives us the multiplier. Combine these and you have the change in GDP resulting from the tariff. Of course if you think the initial tariffs will provoke retaliatory tariffs from the other countries, you have to do the same exercise for those, with perhaps different parameters. Let’s walk through this. Suppose the US — or any country — increases taxes on imports: What can happen? The first question is, how is the price of the imported good set — by costs in the producing country, or by market conditions in the destination? If conditions in the destination country affect price — if the producer is unable or unwilling to raise prices by the full amount of the tariff — then they will have to accept lower revenue per unit sold. This is referred to as pricing to market or incomplete passthrough, and empirical studies suggest it is quite important in import prices, especially in the US. Incomplete passthrough may result in changing profit margins for producers, or they may be able to adjust their own costs — wages especially — in turn. Where trade is a large fraction of GDP, some of the tax may eventually be translated into a lower price level in the exporting country. Under floating exchange rates, the tariff may also lead a depreciation of the exporting country currency relative to the currency of the country imposing the tariff. This is especially likely where trade between the two countries is a large share of total trade for one or both of them. In this case, a tariff is more likely to cause a depreciation of the Mexican peso than of the Chinese renminbi, since the US accounts for a higher fraction of Mexico’s exports than of China’s, and the renminbi is actively managed by China’s central bank. Taking all these effects together, passthrough for US imports is probably less than 0.5. In other words, the majority of a tariff’s impact will probably be on dollar revenue for producers, rather than dollar costs for consumers. So a 10 percent tariff increases costs of imported goods by something less than 5 percent and reduces the revenue per unit of producers by something more than 5 percent. The fraction of the tax that is not absorbed by lower exporter profit margins, lower wages in the export industry or a lower price level in the exporting country, or by exchange rate changes, will be reflected in higher prices in the importing country. The majority of trade goods for the US (as for most countries) are intermediate and capital goods, and even imported consumption goods are almost never purchased directly by the final consumer. So on the importing side, too, there will be firms making a choice between accepting lower profit margins, reducing wages and other domestic costs, or raising prices. Depending on exactly where we are measuring import prices, this might further reduce passthrough. Let’s ignore this last complication and assume that a tax that is not absorbed on the exporting-country side is fully passed on to final price of imported goods. Purchasers of imported goods now respond to the higher price either by substituting to domestic goods, or substituting to imported goods from some third country not subject to the tax, or continuing to purchase the imports at the higher price. To the extent they substitute to domestic goods, that will boost demand here; to the extent they substitute to third-country goods, the tax will have no effect here. 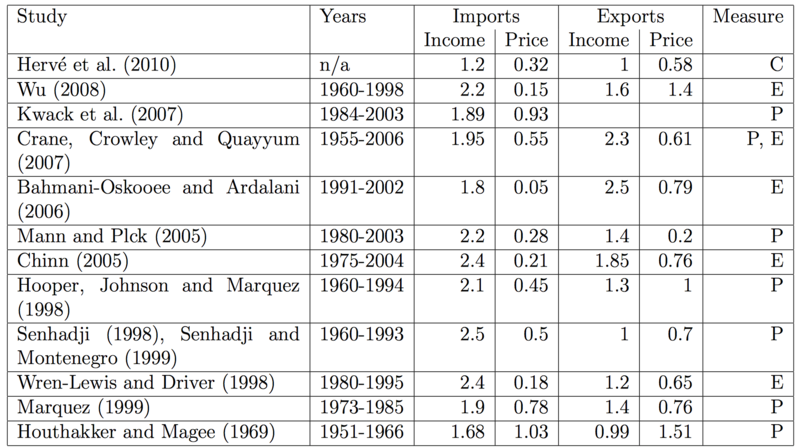 These rates of substitution are described by the price elasticity of imports, computed as the ratio of the percentage change in the price, to the resulting percentage change in the quantity imported. So for instance if we thought that a 1 percent increase in the price of imported goods leads to a 2 percent fall in the quantity purchased, we would say the price elasticity is 2. There are two elasticities we have to think about — the bilateral elasticity and the overall elasticity. For example, we might think that the bilateral elasticity for US imports from China was 3 while the overall price elasticity for was 1. In that case, a 1 percent increase in the price of Chinese imports would lead to a 3 percent fall in US imports from China but only one-third of that would be through lower total US imports; the rest would be through higher imports from third countries. To the extent the higher priced imported goods are purchased, this may result in a higher price of domestic goods for which the imports are an input or a substitute; to the extent this happens, the tax will raise domestic inflation but leave real income unchanged. For the US, import prices have a relatively small effect on overall inflation, so we’ll ignore this effect here. If we included it, we would end up with a smaller effect. To the extent that the increase in import prices neither leads to any substitution away from the imported goods, nor to any price increase in domestic goods, it will reduce real incomes in the importing country, and leave incomes in the exporting country unchanged. Conversely, to the extent that the tariff is absorbed by lower wages or profit margins in the exporting country, or leads to substitution away from that country’s goods, it reduces incomes in the exporting country, but not in the importing country. And of course, to the extent that there is no substitution away from the taxed goods, government revenue will increase. Zandi does not appear to have explicitly modeled this last effect, but it is important in thinking about the results — a point I’ll return to. Whether the increase in import prices increases domestic incomes (by leading to substitution to domestic goods) or reduces them, the initial effect will be compounded as the change in income leads to changes in other spending flows. If, let’s say, an increase in the price of Chinese consumer goods forces Americans to cut back purchases of American-made goods, then the workers and business owners in the affected industries will find themselves with less income, which will cause them to reduce their spending in turn. This is the familiar multiplier. The direct effect may be compounded or mitigated by financial effects — the multiplier will be larger if you think (as Zandi apparently does) that a fall in income will be accompanied by a fall in asset prices with a further negative effect on credit and consumption, and smaller if you think that a trade-induced change in income will be offset by a change in monetary (or fiscal) policy. In the case where central bank’s interest rate policy is always able to hold output at potential, the multiplier will be zero — shocks to demand will have no effect on output. This extreme case looked more reasonable a decade ago than it does today. In conditions where the Fed can’t or won’t offset demand impacts, estimates of the US multiplier range as high as 2.5; a respectable middle-of-the-road estimate would be 1.5. Let’s try this with actual numbers. following a 10 percent depreciation of the dollar, U.S. import prices increase about 1 percentage point in the contemporaneous quarter and an additional 2 percentage points over the next year, with little if any subsequent increases. The factors that lead to incomplete passthrough of exchange rate movements — such as the size of the US market, and the importance exporters of maintaining market share — generally apply to a tariff as well, so it’s reasonable to think passthrough would be similar. So a 45% tariff on Chinese goods would probably raise prices to American purchasers by only about 15%, with the remainder absorbed by profits and/or wages at Chinese exporters. Next we need to ask about the effect of that price on American purchases. There is a large literature estimating trade price elasticities; a sample is shown in the table below. As you can see, almost all the import price elasticities are between 0.2 and 1.0. (Price elasticities seem to be greater for US exports than for imports; they also seem to be higher for most other countries than for the US.) The median estimates is around 0.5 for overall US imports. Country-specific estimates are harder to find but I’ve seen values around 1.0 for US imports from both China and Mexico. Using those estimates, we would expect a 15% increase in the price of Chinese imports to lead to a 15% fall in imports from China, with about half of the substitution going to US goods and half going to imports from other countries. Similarly, a 10% increase in the price of goods from Mexico (a 35% tariff times passthrough of 0.3) would lead to a 10% fall in imports from Mexico, with half of that being a switch to US goods and half to imports from elsewhere. Selected trade elasticity estimates for the US. The last column indicates if “price” was measured with an import price index (P), the exchange rate (E), or competitiveness, i.e. relative wages (C). The “P” estimates are most relevant for a tariff. Finally, we ask how the combination of substitution away from imports from Mexico and China, and the rise in price of the remaining imports, would affect US output. US imports from China are about 2.7 percent of US GDP, and imports from Mexico are about 1.7 percent of GDP. So with the parameters above, substitution to US goods raises GDP by 7.5% x 2.7% (China) plus 5% x 1.7% (Mexico), or 0.29% of GDP. Meanwhile the higher prices of the remaining imports from China and Mexico reduce US incomes by 0.22 percent, for a net impact of a trivial one twentieth of one percent of GDP. Apply a standard multiplier of 1.5, and the tariffs boost GDP by 0.08 percent. And the very low price elasticity you need for this result has some funny implications. For instance, it implies that when China intervenes to weaken their currency, they are just impoverishing themselves, since — if demand is really price-inelastic — they are now sending us the same amount of goods and getting fewer dollars for each one. I doubt Zandi would endorse this view, but it’s a logical corollary of the ultra-low elasticity he needs to get a big cost to the US from the initial tariff. Note also that the low-elasticity assumption means that the tariff creates no costs for China or Mexico: their exporters pass the increased tariff on completely to US consumers, and lose no sales as a result. It’s not clear why they would “retaliate” for this. Let’s assume, though, that China and Mexico do impose tariffs on US goods. US exports to China and Mexico equal 0.7 and 1.3 percent of US GDP respectively. Passthrough is probably higher for US exports — let’s say 0.6 rather than 0.3. Price elasticity is also probably higher — we’ll say 1.5 for both bilateral elasticities and for overall export elasticity. (In the absence of exchange-rate changes, there’s no reason to think that a fall in exports to China and Mexico will lead to a rise in exports to third countries.) And again, we’ll use a multiplier of 1.5. This yields a fall in US GDP from the countertariffs of just a hair under 1 percent. Combine that with the small demand boost from the tariff, and we get an overall impact of -0.9 percent of GDP. I admit, this is a somewhat larger hit than I expected before I worked through this exercise. But it’s still much smaller than Zandi’s number. My preferred back-of-the-envelope for the combined impact of the tariffs and countertariffs would be a reduction in US GDP of 0.9 percent, but I’m not wedded to this exact number. I think reasonable parameters could get you an impact on US GDP anywhere from positive 1 percent to, at the worst, negative 2 percent or so. But it’s very hard to get Zandi’s negative 5 percent. You need an extremely high passthrough for both import and export prices, plus extremely price-inelastic US import demand and extremely price-elastic demand for US exports — all three parameters well outside the range in the empirical literature. At one point a few years ago, I collected about 20 empirical estimates of US trade elasticities, and none of them had a price elasticity for US exports greater than 1.5. But even with 100% passthrough, and a generous multiplier of 2.0, you need an export price elasticity of 4 or so to get US GDP to fall by 5 points. Still, while Zandi’s 5 percent hit to GDP seems beyond the realm of the plausible, one could perhaps defend a still-substantial 2 percent. Let’s think for a moment, though, about what this would mean. First of all, it’s worth noting — as I didn’t, unfortunately, to the Post reporter — that tariff increases are, after all, tax increases. Whatever its effect on trade flows, a big increase in taxes will be contractionary. This is Keynes 101. Pick any activity accounting for 5 percent of GDP and slap a 40 percent tax on it, and it’s a safe bet that aggregate income will be lower as a result. The logic of the exercise would have been clearer if the tariff revenue were offset by a cut in some other tax, or increase in government spending. (Maybe this is what Trump means when he says Mexico will pay for the wall?) Then it would be clearer how much of the predicted impact comes from the tariff specifically, as opposed to the shift toward austerity that any such a big tax increase implies. The point is, even if you decide that a 2 percent fall in US GDP is the best estimate of the tariff’s impact, it wouldn’t follow that tariffs as such are a bad idea. It could be that a big tax increase is. Second, let’s step back for a moment. While Mexico and China are two of our largest trade partners, they still account for less than a quarter of total US trade. Given passthrough of 0.3, the 45/35 percent tariff on Chinese/Mexican goods would raise overall US import prices by about 3 percent. Even with 100 percent passthrough, the tariffs would raise overall import prices by just 10 percent. The retaliatory tariffs would raise US export prices by about half this — 5 percent with full passthrough. (The difference is because these two countries account for a smaller share of US exports than of US imports). Now, let’s look at the movements of the dollar in recent years. Since 2014, the dollar has risen 15 percent. That’s a 15 percent increase in the price of US goods in all our export markets — three times the impact of the hypothetical Mexican and Chinese tariffs. But before that, from 2002 to 2008, the dollar fell by over 20 percent. That raised the price of US imports by twice as much as the hypothetical Trump tariff. And so on on back to the 1970s. If you believe Zandi’s numbers, then the rise in the dollar over the past two years should already have triggered a severe recession. Of course it has not. It would be foolish to deny that movements of the dollar have had some effect on US output and employment. But no one, I think, would claim impacts on anything like this scale. 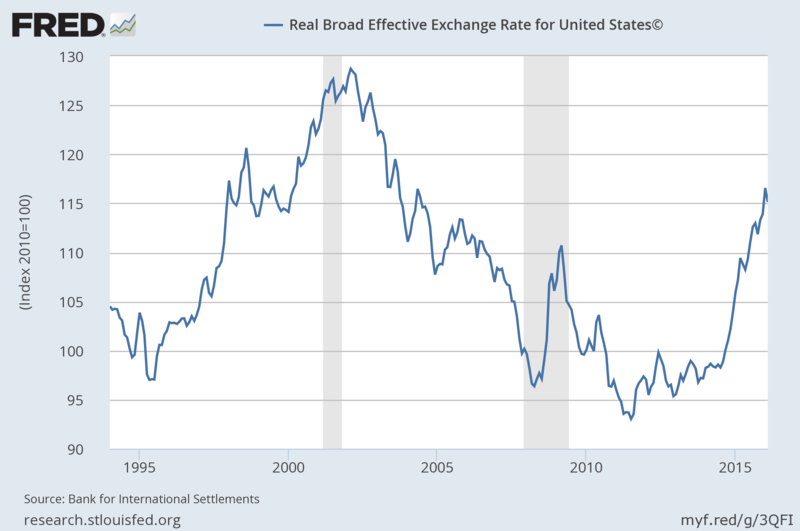 Still, one thing is for sure: If you believe anything like Zandi’s numbers on the macro impacts of trade price changes, then it’s insane to allow exchange rates to be set by private speculators. So if Zandi is wrong about the macro impact of tariffs, does that mean Trump is right? No. First of all, while I don’t think there’s any way to defend Zandi’s claim of a very large negative impact on GDP of a tariff (or of a more respectable, but economically equivalent, depreciation of the dollar), it’s almost as hard to defend a large positive impact. Despite all the shouting, the relative price of Chinese goods is just not a very big factor for aggregate demand in the US. If the goal is stronger demand and higher wages here, there are various things we can do. A more favorable trade balance with China (or Mexico, or anywhere else) is nowhere near the top of that list. Second, the costs of the tariff would be substantial for the rest of the world. It’s important not to lose sight of the fact that China, over the past generation, has seen perhaps the largest rise in living standards in human history. We can debate how critical exports to the US were in this process, but certainly the benefits to China of exports to the US were vastly greater than whatever costs they created here. But the fact that an idea is wrong, doesn’t mean that we can ignore evidence and logic in refuting it. Trumpism is bad enough on the merits. There’s no need to exaggerate its costs. UPDATE: My spreadsheet is here, if you want to play with alternative parameter values. I think I understand your reasoning that tariffs or protectionism would not be the cure all that people think. That being said I think we still need to have companies that “make things” where young people can learn a craft. A while back I read Factory Man by Beth Macy about the decline of the furniture industry in the US. That is the dark side of globalization. Hundreds of people lost generations of jobs. And while I agree that trade has positives, too much cheap crap has been made in China such as furniture when young people here need to learn to make things. I think trade has huge environmental costs as well. In the Jackie Robinson documentary they talk about how everything you need to live you could buy within two blocks back then. Let’s do it already. The conventional wisdom has been a disaster. Maybe there will be another disaster but maybe not. How hard can it be to gain jobs if you move to balanced trade when you have a 500 billion / year trade deficit in manufactured goods? This seems like a no-brainer. And a rocky transition is worth it if it saves us from a working class that supports dictatorship because the whole neoliberal elite class has embraced their destruction.